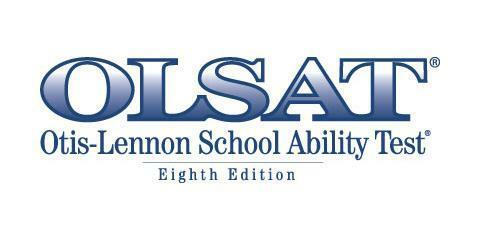 Are you looking for information on the Otis-Lennon School Ability Test (OLSAT®)? You’ve come to the right place. What is the Otis Lennon School Ability Test (OLSAT®)? What is the OLSAT® Used For? Which Age Group Does The OLSAT® Test? What Content Is on the OLSAT®? What is the Format of the OLSAT®? How do you Interpret OLSAT® Test Scores? What is the Difference between the OLSAT® and other Gifted Tests? What is the Best Way to Prepare for the OLSAT®? Where Can I Find OLSAT Sample Questions? WHAT IS THE OTIS-LENNON SCHOOL ABILITY TEST (OLSAT®)? So, what is the OLSAT®? In short, this is a test that measures an individual’s ability to reason logically and think abstractly. Specifically, it tests a variety of skills and abilities in students aged 4-18, including verbal and quantitative skills and spatial reasoning ability. Technically, the OLSAT® is not an“IQ” test but an achievement test, but this categorization can be confusing as it is not a traditional achievement test which measures what knowledge has been taught or learned in school. Rather, a better description might be an‘aptitude’ test, because the test focuses on measuring how students perform tasks specifically related topotential for success and achievement in school. These tasks are designed to measure those skills that indicate a student’s aptitude for success in an academic setting and include critical thinking, reasoning abilities and problem-solving skills. What is the Otis-Lennon School Ability Test Used For? 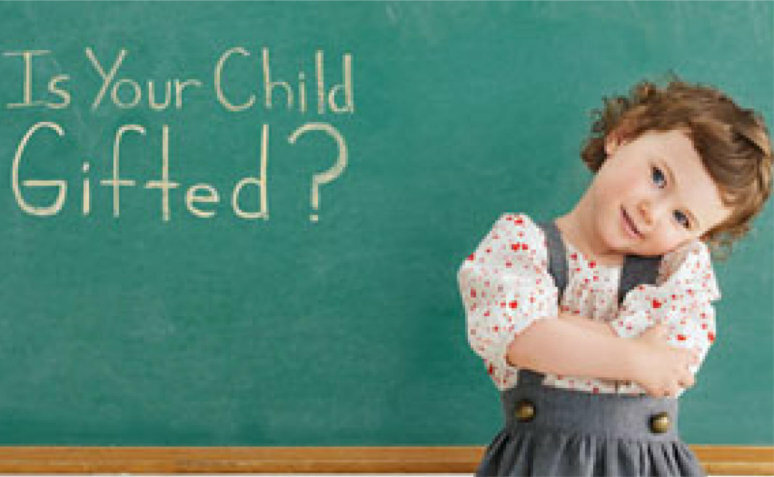 children for gifted and talented programs. In the elementary years, the OLSAT® is one of the most common tests used for identifying gifted children. For example, the OLSAT® (along with the Naglieri Non Verbal Abilities Test®) is used for admissions into gifted and talented programs in NYC for students entering Kindergarten through 3rd grade. The Gifted Program in the Chicago Public School System also uses the same concepts as those on the OLSAT®. The test is also used by many schools to help identify strengths and weaknesses of students, which in turn can help inform decisions about which student might benefit from placement in advanced or remedial classes. The latest edition of the OLSAT® test used in schools and by gifted programs is the OLSAT® 8. This most recent edition has some substantial changes for younger students, including additions that made the test more accessible to children by use of more interesting and engaging graphics. Also, the test items for younger students are ‘spiraled’, which means they are structured such that difficult questions are followed by easier questions so that the student does not get discouraged and confidence not undermined. However, in other test levels, for example, level D, the figural and verbal questions are presented in order of difficulty. There are seven test levels (A-G). Each level corresponds to a grade or several grades. Please note that, in terms of admission into most gifted programs, each level is associated with the grade that the child is in currently, and not the grade the child WILL be entering after the test is taken. Pre-K students testing for entry into Kindergarten gifted programs take Level A.
Kindergarten students testing for entry into Grade 1 gifted programs take Level A. 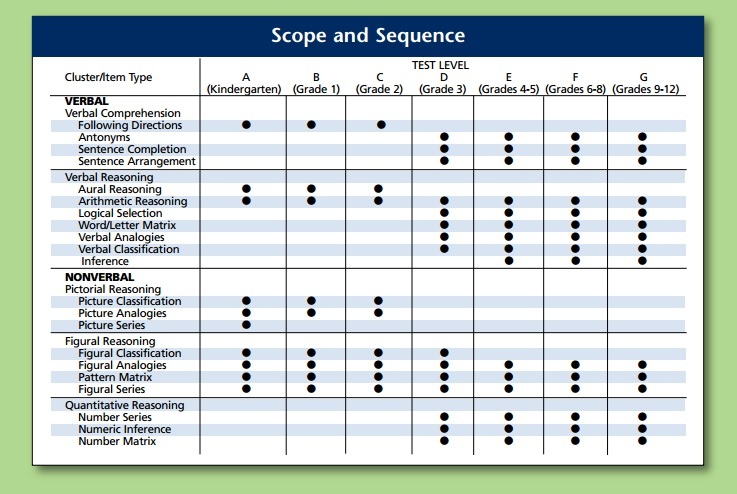 However, a school or gifted program may use a different level than this chart shows depending on how the school is using the test. Always check first with your school or the school you are planning to send your child too. The test’s content and structure (and the skills and abilities tested) evolves according to the different levelsand as the child gets older. For example, picture-based reasoning tasks are no longer present in the 3rd grade test, which focuses more verbal-based reasoning tasks over figural-based tasks. Students in third grade also start to be tested on a quantitative reasoning. in the 4th grade tests and up, figural classification items are no longer included, and inferential reasoning is introduced. The following chart shows the which elements are tested at the various levels. The following part of our article explains the sections and question types on the OLSAT® in more detail. The verbal comprehension questions are aimed at measuring students’ ability to gather and manipulate information from language. 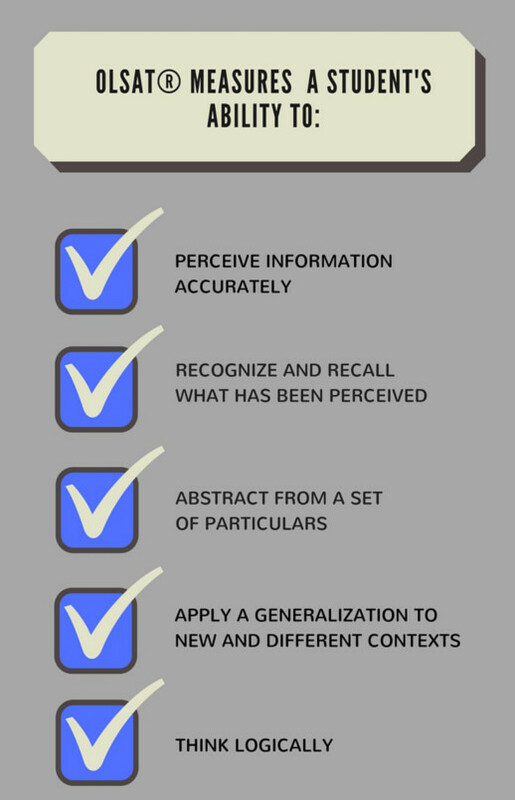 In particular, these questions seek to evaluate how students understand the way words and sentences relate to each other, and also how students interpret nuances in language. understanding phrases such as as "below", "above" and "in between". the blank(s)" and choose word(s) that create a complete, logical sentence. take fragmented parts and, from them, create a whole. 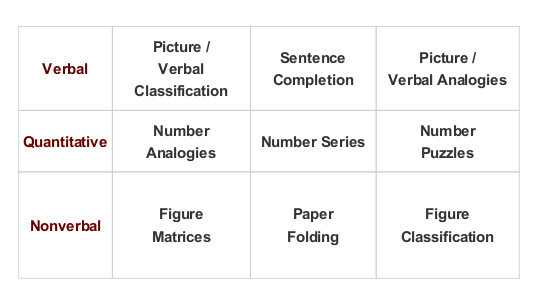 The verbal reasoning component of the test measures a student’s ability to comprehend patterns, relationships, and context clues in writing in order to solve a problem. In order to be successful in answering these questions, students must be able to fully understand what a question is asking, as well as make inferences based on what they have read. The verbal comprehension section has seven types of questions. Picture Analogies A-C In these questions, students are presented with a 4-box matrix and must identify a relationship between two objects in the first row. The student needs to apply this rule to the second row and choose which object - from the answer choices - completes this second row relationship in the same way. The OLSAT format is described below. We have highlighted some changes in the exam format (for example, the number of questions) according to the test level. The questions are in multiple-choice format with 4 to 5 answer options for each. Students should choose an answer choice for every question as points are not deducted for answering incorrectly. The number of questions also depends on the test level, varying from 40 to 72. Level A (Pre K) has 40 questions. Level A (K), Level B and Level C each have 60 questions. Level D has 64 questions and Levels E-G have 72 questions. Please see table for further information on timing and question number according to test level. The test is administered to older children in groups. Pre-schoolers take the test individually in a one on one setting. Pre-k students only need to point to the answers. Older children must mark their answers on the test or on a bubble sheet. Levels A and B are read aloud to students. The person administering OLSAT®- 8 is usually a teacher or school administrator. The administrators of the test are familiar with the procedures, but do not have any special training or certification. Is the Otis-Lennon School Ability Test valid and reliable? The OLSAT® is regarded as a reliable and valid measure of the aspects of intelligence it was created to measure. It is viewed as reliable because students who take the test many times tend to score approximately the same each time. It is also considered to be free of cultural and gender biases. It is also regarded as valid since studies have indicated that the test effectively assesses the reasoning and problem-solving abilities that it was designed to assess. Although there are other tests that can measure intelligence and aptitude in school-settings, the OLSAT® is widely used as it can be administered relatively inexpensively compared to other tests such as the Stanford Binet, which require a one-on -one setting and a trained psychologist to administer. A OLSAT® score provides an assessment of a student’s general reasoning ability compared to peers in the same age range. A student’s OLSAT® score is calculated by first turning the raw score into a score on the School Ability Index (SAI). The raw scoreis defined as the student’s total number of correct answers. For example, the raw score would be “20” if 20 questions were answered correctly out of a total 36 questions. The SAI score provides more information than the raw score because it highlights a student’s overall ability score compared to other students (in the same three-month age band) who took the test at the same time. An SAI score cannot be interpreted like a raw score. For example, a one point difference in score does not mean that a child could get one more answer correct and move to the score above (eg: from 129 to a 130). This is because one point represents more than one incorrect answer on the SAI index. 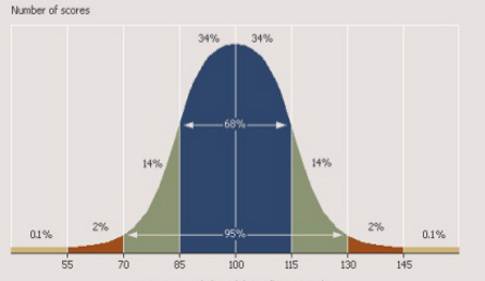 Percentile rank is useful in indicating a student’s relative standing on the test compared to the rest of the students of the same age. For example, a student in the 50th percentile scored higher than 50 percent of students in the same age group who took the same test. A percentile rank of 50 means the student got as many questions right as a child who got a SAI score of 100. It also does not indicate that the student only got half the questions correct. The SAI score has a mean of 100 regardless of the age of the student or which form of the test they took. That means that the average score for a student of any age is 100. The majority of kids achieve an average score falling somewhere between 85 and 115 (68%). Fewer children reach a score between 116-132 (14%) and 68-84 (14%). A small number (2-3%) of children achieve a score higher than 132 (which puts them in the 97-99th percentile) or a lower score than 68. 150 is the maximum score. The qualifying score varies among gifted programs, but it ranges usually from 130-132, which targets 2-3% of students who have taken the OLSAT. 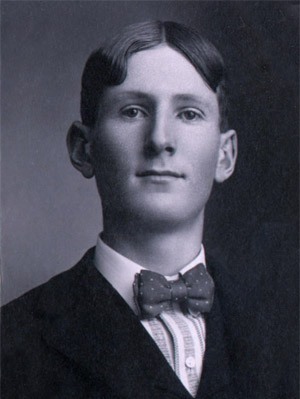 The Otis-Lennon School Ability Test was written by Arthur S. Otis and Roger T. Lennon. The name Otis-Lennon reflects the surnames of these two people. Dr. Otis is most well-known for developing intelligence tests for the U.S. Army in an effort to improve cost and time efficiency of administering comparable tests like the Stanford Binet. Dr. Otis was also the first to use multiple choice test on a large scale. Mr. Lennon, was the marketing brains behind the growth and popularity of the OLSAT as a test to measure ability for success in school. He ran the test division of the publishing house that built on the original tests created by Dr Otis. The OLSAT test is published by NCS Pearson, Inc., but was originally owned by Harcourt Assessment, Inc./The Psychological Corporation. OLSAT® vs Naglieri NonVerbal Ability Test®: What is the difference between the OLSAT® and NNAT®? The Otis Lennon School Ability Test (OLSAT) and the Naglieri Nonverbal Ability Test (NNAT) both provide an economical way, for schools, to measure logical reasoning and problem solving abilities of gifted and talented candidates in the early years. The tests also can both serve as vehicles to assess and compare an individual student’s annual progress from grade to grade. One of the main differences is that the Naglieri Test assesses ability without the requirement of reading, writing, or speaking the English Language. This means that the test is viewed as a reliable measure of abilities in students for whom English is a second language. Because of this, the NNAT® is considered culturally unbiased. Students who may have a learning disability, such as vision problems, can also benefit from taking this test versus other aptitude or academic ability tests. This is because the format of the Naglieri test consists of only nonverbal questions (Pattern Completion, Reasoning by Analogy, Serial Reasoning, and Spatial Visualization) presented in two colors. Different Schools use different tests to make their assessments of students. Always check with your specific school district or school to find out which test is being used. OLSAT® vs Stanford Achievement Test(SAT): What is the difference between the OLSAT® and SAT? The main difference is that the Stanford Achievement Test (SAT) assesses a student’s abilities in math, reading, science and social studies. The test’s aim is to assesses each student’s knowledge as it relates to these academic subjects. Test results provide a measure of whether a student is achieving grade-level expectations. The OLSAT measures a student’s abstract thinking and reasoning ability,and is widely known as a measure of general learning ability (rather than a measure of what is ‘taught’) and to assess young students applying to gifted and talented programs. In some schools, both tests are taken together and can reveal a student’s learning ability in conjunctions with his or her actual school achievement. There are also differences in format between the SAT and the OLSAT. This includes that that the SAT is untimed, whereas the OLSAT is administered in a timed setting. The Stanford Achievement Test consists of short-answer, multiple-choice and extended-response questions, whereas the OLSAT has only a multiple-choice format. The OLSAT can be administered by computer or paper-based, while the SAT is only offered on paper. Lastly, the SAT has 13 levels to the OLSAT’s seven levels. OLSAT® vs Cognitive Abilities Test® (COGAT®): What is the difference between the OLSAT® and COGAT®? The OLSAT-8 and the COGAT-7 (the newest versions of both tests) have quite a few similarities. Both tests measure reasoning and problem solving abilities, which are skills that are widely considered necessary to academic success. Both tests are also widely used by schools as a way to assess students for gifted education programs. However, one of the tests is often favored by a school district. For example, in NYC, the OLSAT used (in conjunction with the NNAT), whereas the COGAT is used in the state of Washington state and California. Like the OLSAT, the COGAT has different levels for students in grades K-12. There are ten CogAT levels, compared to the seven levels of the OLSAT. 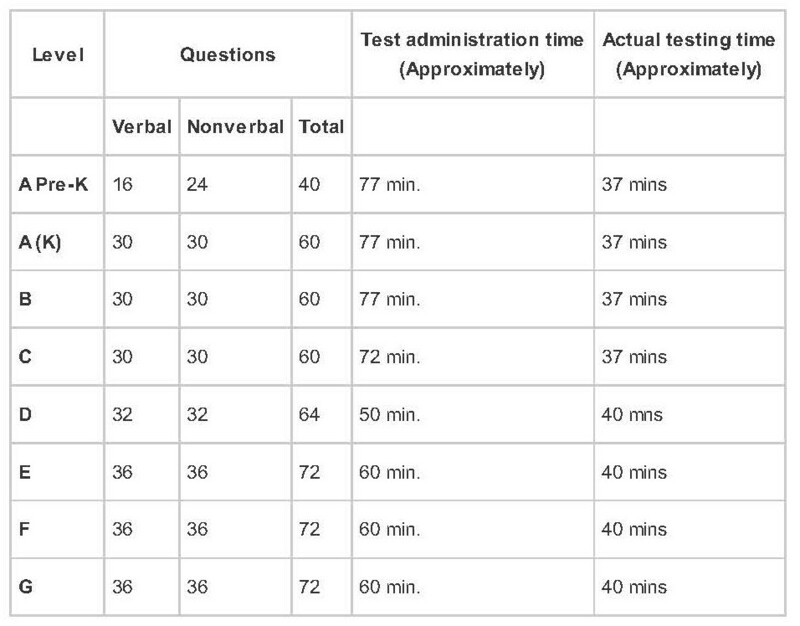 Format-wise, they are both group-administered, multiple-choice, and timed tests, but the COGAT has 3 sections (verbal, non-verbal and the quantitative) compared to the two sections of the OLSAT. As a general test preparation strategy, we recommend that you first review each question type on the OLSAT with your child and ask him or her to solve practice questions without a time restriction. Then, spend time analyzing the answers and explanations (both incorrect and correct) for each question. You can also diagnose your child’s weaknesses by analyzing her scores on a practice test. Then, focus study time on reviewing and practicing more of the question types that your child finds tricky or regularly stumbles on. Preparing for the OLSAT gives students a chance to know how to respond when faced with unfamiliar and perplexing questions. The test measures a student’s academic performance but also his ability to manage time efficiently and capacity to keep calm and focused under pressure. Every family and student will approach preparation for this test differently. There is no ‘right’ way to prepare; there is only the best way for a particular child and family. Some take the ‘cram’ approach, loading up on as many hours as possible before the test date. Other parents think too much focus on preparation may create anxiety in their child that could backfire on test day. In this case, a more low-key approach may work best. With that said, repeated exposure to the format and nature of the test will help a student prepare for a test which covers challenging topics that students may not see in school, and which require students to think a little differently in order to do well. We suggest students, at minimum, take one practice test (preferably under timed conditions) and spend a minimum of 8-10 hours working through OLSAT® type questions. For younger children, 15-30 minutes a day of practice is a good target for which to aim. 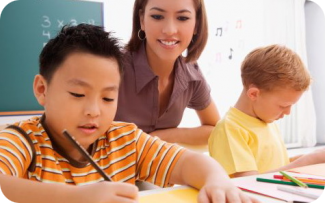 Older students, with longer attention spans, can do more each session. Get started practicing now by clicking the button below to access 30 free OLSAT practice questions. We will also send you a list of activities that you can do with your child to help him or her practice the higher-thinking skills that she will use to perform successfully on the test. Also, please remember that these kind of exercises have usefulness in other areas of life than testing. Practicing these skills will help your child’s ability to problem solve and reason in a logical manner -- a skill that will help your child succeed not only in taking the Otis Lennon School Ability Test but in other areas too.